Holmsey and Fergus sat quietly by my side as I stitched. Fergus in particular, was being unusually quiet. “Whatever is the matter?” I asked them as I blew my nose loudly. “We’re very worried about you!” Holmsey murmured as he snuggled his little head under my big thick blanket. Fergus tried to do the same, but, being a lot bigger than the little hare; my blanket just covered his head. With his little nose poking out, he looked just like a goat in a coat! “You seem to be dreadfully ill!” Holmsey said, his little voice trembling. Fergus nodded his head in agreement, his huge, brown eyes filled with concern. Holmsey and Fergus looked at each other and didn’t seem to be reassured. “Oh yes please!” cried Fergus as he leapt up in glee and started to bounce around my living room, taking my blanket with him. He looked like a deer-shaped ghost as the blanket flapped around his head! “What shall we give as a prize?” asked Holmsey. “How about the three Holmsey books, all signed by myself and Paula? And of course if there are any authentication certificates left, we can include them as well. What do you think? 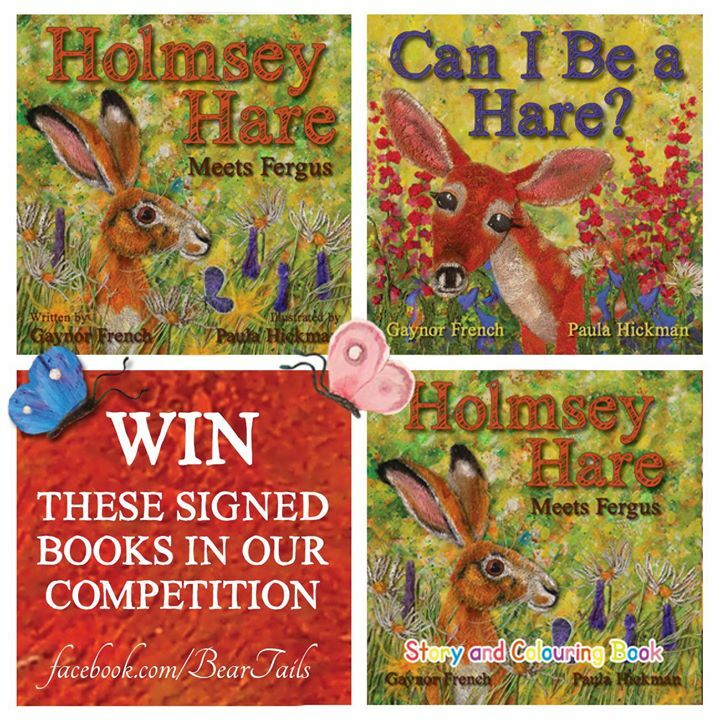 “So that would be ‘Holmsey Hare Meets Fergus’, ‘Can I Be a Hare’ AND the ‘Holmsey Meets Fergus’ colouring book?” queried Holmsey. “Yes! Yes! Yes!” came a muffled cry from Fergus who was busy trying to untangle himself from my lovely but now quite mucky blanket. “Ok then. Let’s think. What sort of competition shall we have? Holmsey had and as he passed it to me, I wrote the competition down and showed them what you have to do to enter. So, with their approval, here is the competition and the rules. And the winner will receive three very unique books, signed by myself and Paula. Winner to be announced on the 9th of April. 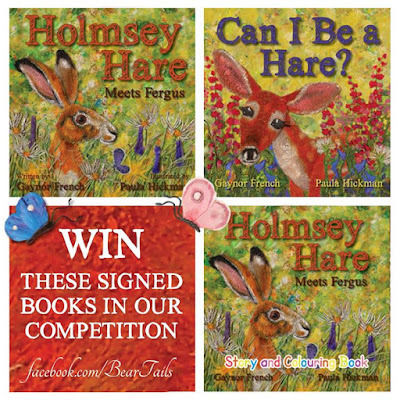 Good luck to all your FB readers, a fabulous prize. What fun! Feel better soon; "just a cold"s have been lasting far too long.